Pedestal paver supports is something we have been doing for a long time. We knwo what works and what doesnt. Pedestal paver supports come in many shapes and sizes and there is no perfect solution for every product. That is why we carry several brands and types of pedestals. Different heights, different surfaces and applications require a unique system. No one pedestal system is perfect for every type of raised floor and thats why our pedestal line up is so unique to others out there offring only one type of system. Our product line varies from adjustable telescoping pedestals to proprietary foam block support systems to fixed height rubber spacer pads. 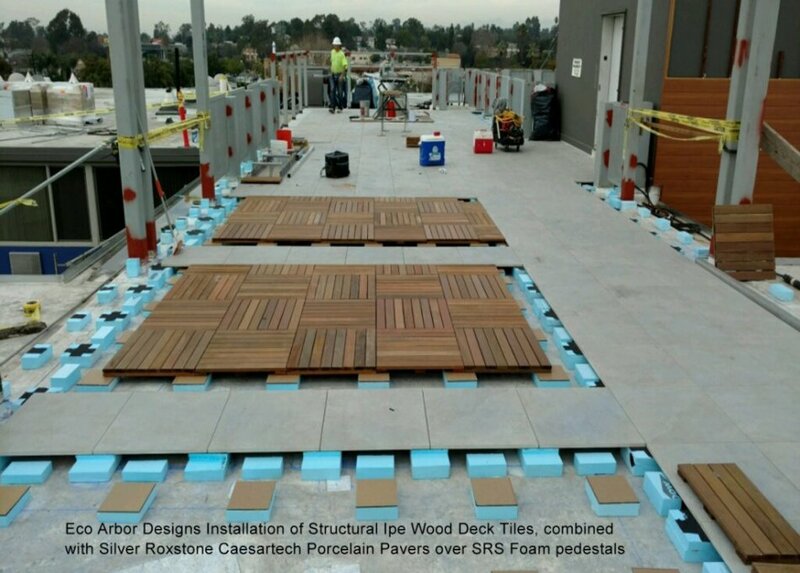 We have a solution for your raised outdoor floor application. Click through our pedestal product line and of course call us with any questions. Elmich telescoping pedestals are perhaps the best telescoping support system in the world today. Far surpassing the competition in both weight they can hold and circumference of the top. Both giving you an easier installation and more solid support. The unique top slope corrector is not a self leveling design which is known to come loose over time and rattle when walked on. Elmich slope correctors give you the compensation from 1-5%. 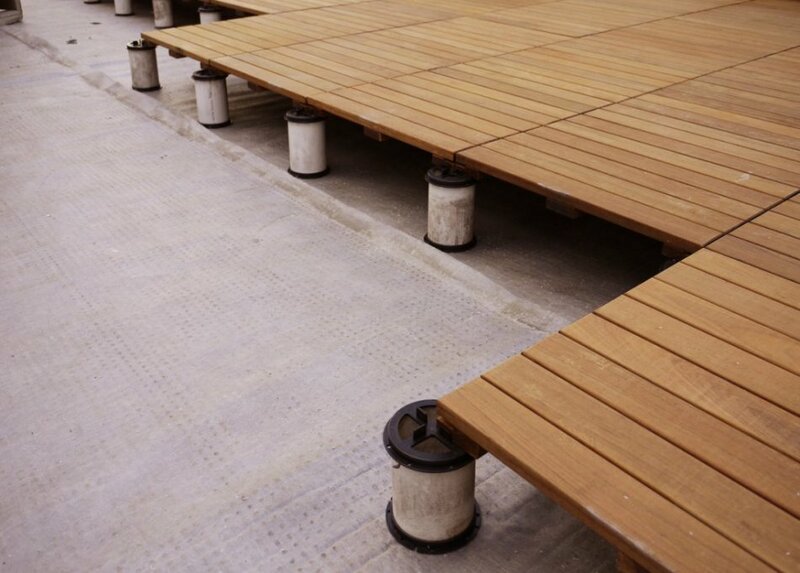 This range is more than any other pedestal in the market for the most challenging sloped decks. Just turn the corrector until level. With varying spacer tabs for different types of pavers. on the top will give precision spacing to the pavers. 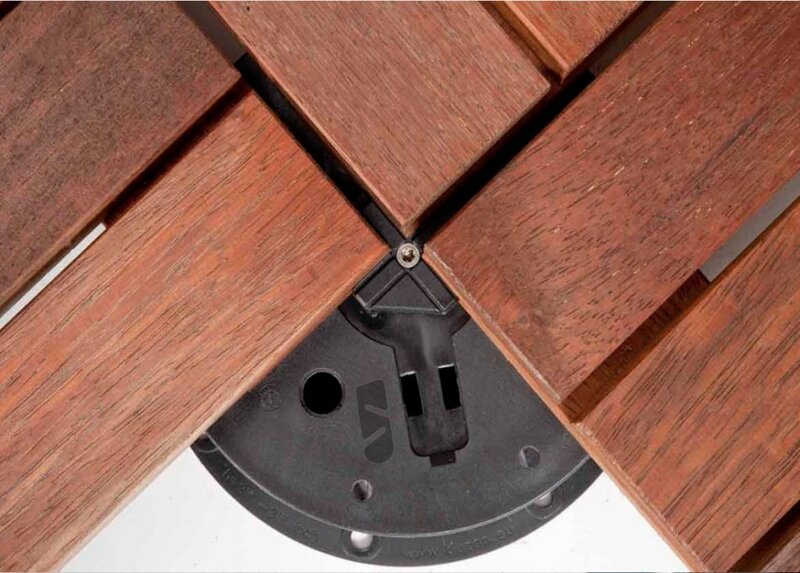 For our wood pavers qwe have the best wood fastening system in the market. The piece screws down tot he center of the pedestal creating a tight bond to the paver on top. 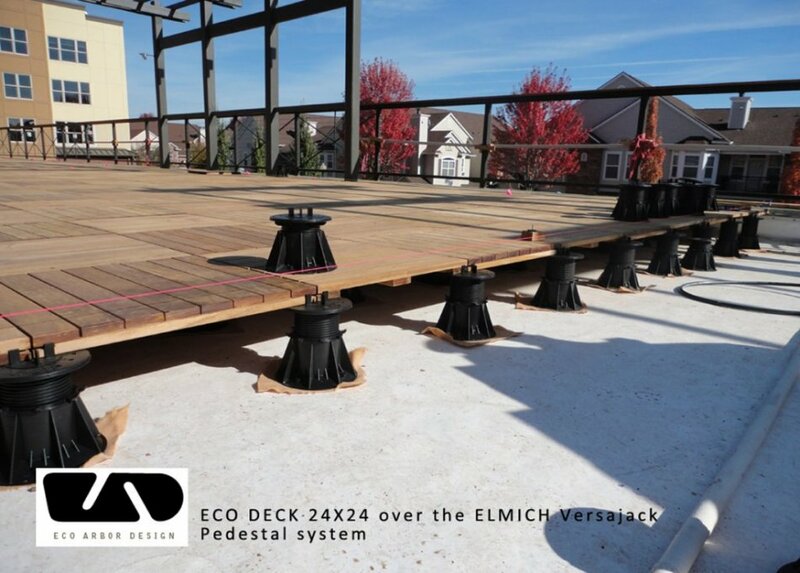 With superior adjustability and an increadible max dead load of 4000 lbs, the Elmich Versajack series will handle the most demanding raised floor applications. The Versajack line is a "screw up or down" pedestal system accomodating heights from 1.5"-30". Our most common models are the F2, F3 and F4 accomodating heights from 2"-8"
- Adjustable pedestal from .5" - 36"
Spirapave Pedestals is based on a unique one of akind step design for supporting raised paver floors and timber decks. Ladder Pedestals are engineeered to provide versatil and cost effective soltutions to low height raised floors. Spirapaver Pedestals provide enough height to conceal services and will improve heat and sound insulation all the while allowing normal drainage to occur underneath. The result is a lightweight support system that you can count on in even the most demanding commercial environments. Starting at heights ranging from .5" going to 3". Slope correction is compensated from 1-5% with an easy top cap slope compensator. Spacers tabs of 1/8th and above are available. Please call us toll free 1 888 335 8453 for a quote and layout help depending on which surface product you are considering. Sprirapave pedestals with there unique 1mm increment adjustability make the widest footprint for the heaviest pavers. Spirapave have become the defacto pedestal for stone and porcelain pavers. Low Minimum height is ideal for installations where other height adjustable pedestals are generally too high or cannot be micro tuned easily. Spirapave may be used with Versajack pedestals as an accessopry or for additional height. Spirapave has a compressive strength of >20kN. One of the most heavy duty adjustable pedestals on the market today. With a steel locking pin to fix the height of each pedestal once your paver is level you can be rest assured it will stay that way. PVC based pedestals are a cost effective way to get a raised floor up to 36" in height at a low cost. Utilizing a Schedule 450 PVC pipe which is then cut to create the riser. The self leveling head is adjustable from 3/4" to 2.5" to then fine tune the final height. This pedestal system has been a great application for heights above 8" where telescoping native height pedestals can become expensive. 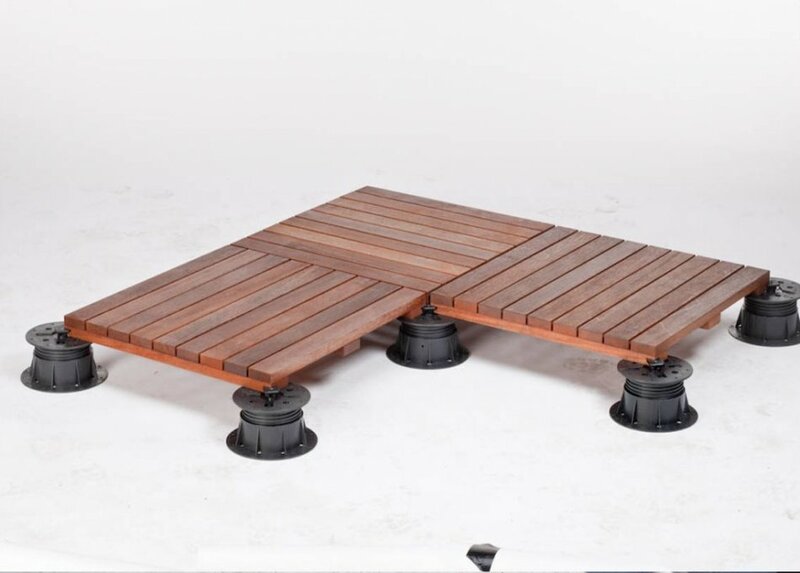 The self leveling head makes an easy adjustment to the top and any of our pavers (wood , porcelain or stone can be mounted on top with the applicable spacer head. For the very lowest of elevations where the threshold dictates your final height we developed a solution. At just 3/8th and 5/8ths thickness these neoprene rubber supports with built in 1/8th spacer tabs will elevate the pavers just enough to allow for drainage. These are the best solution for porcelain pavers and wood pavers over surfaces where low finished heights are needed. These rubber fixed height supports are stackable and therefore can be raised to accomodate up to 1.5" in height. Fixed height rubber supports are superior to plastic fixed height systems in that they give you superior sound and vibration absorption, and greater friction to the surface paver ensuring no movement or wobble. The concept is pure and simple, the result is patented pedestal system that is economical and equal to plastic adjustable pedestal systems. 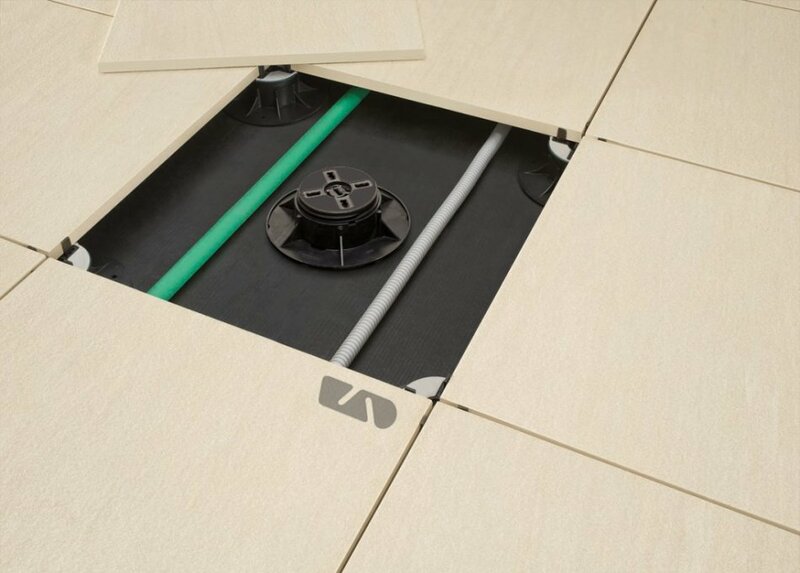 The Foam Block levelling support system combines straightforward technology with proven materials to product a one of a kind support system under any desired paver material. High density foam is inexpensive, extremely durable in 60 or 100 psi. Typically Dow styrofoam, or Owens-Corning Foam supply this high density foam. This material is commonly used on roof decks and is ASTM rated and fully conformes to todays building standards. Pedestals can be installed for any height, load or slope and will support any paver size and type. Complex designs can be cut and supported by the pedestal matrix. Positioning the pedestal blocks is quick and easy and requires no special shimming or bracing regardless of pedestal height. Secured using construction adhesive, once in place they will not shift or move. Once dsecured the levelling begins. Utilizing a hot wire trolley riding on a laser leveled track trims the excess material above the bottom of paver elevation. This method allows our installer to level a large area of pedestals in a short amount of time. The result is a perfectly leveled foam block support system. The foam blocks create a stable base for the pavers regardless of the irregularity of underlying conditions. The Eterno SE range of pedestals is for those looking for a adjustable plastic pedestal with a self leveling head. Best applied for use with pavers weighing less than 10 lbs per sq ft as heavy pavers can create a wobble in the floor. Eterno pedestals will perform well and create a level surface to install your lightweight paver. Eterno pedestals give the ability to adjust the height from above without removing the paver after the installation of surface material. With built in rubber pad and spacer tabs, Eterno is a one piece unit. You will find that the Eterno line of pedestals although more expensive can create an easy install. - Special height adjustment tool(sold seperatly) allows height adjustment from above the paver surface. - Ligthweigth and strong plastic construction. Purchase an used Pedestal Supports for only $20.00*.